OOooh... our new display rack from My Mind's Eye arrived today and filled up with papers & embellishments it's just so pretty! We've got 30 new papers from their Tres Jolie & Signature Life lines, and they're really just... lovely! Here's a layout & card by Helki using products from the Signature Life collection and a card I put together with some Tres Jolie papers and the new embossed chipboard they released with this line! Wow, it's so cool.. texture on your chipboard that pops when you ink it up like I did on this card! (stamp by Hero Arts) There is embossed chipboard in a set of assorted tags & shapes and two different monogram sets. It's all just fabulous! I look forward to exploring the possibilites! Come check out out new display & all the coordinating die cuts (titles, tags, quotes, frames & more!). I wanted to share another layout from the QK design team (a new release means LOTS of great new ideas in their project gallery!) 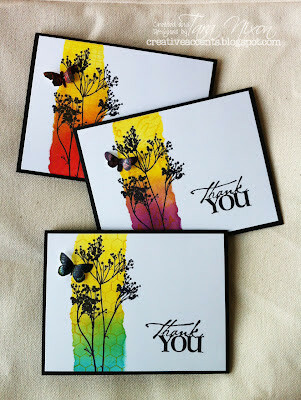 I loved the use of the alphabet & flourish (and alphabet) stamps (all of which is included!) 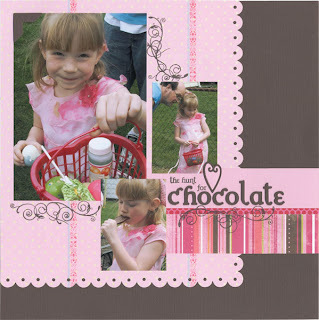 from the Spring Gift set on this Easter layout celebrating chocolate! Cute, cute page! Love it!